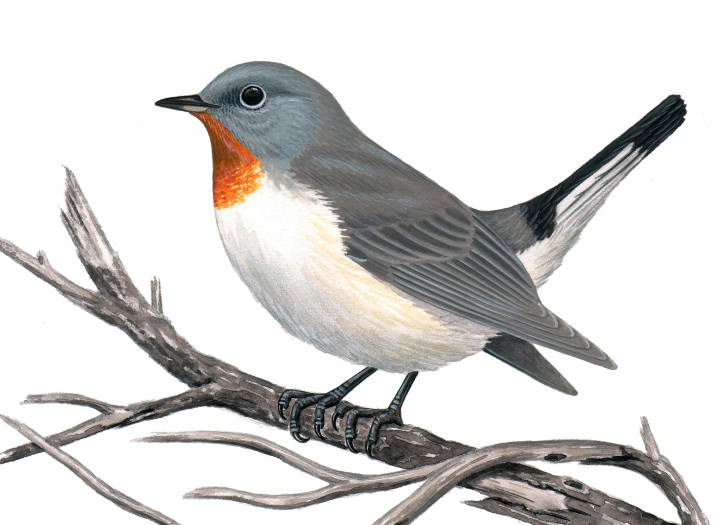 The Red-Breasted Flycatcher is a paleartic species, nesting in Eurasia (the taiga, Altai, Caucasus, Asia Minor, Europe, the Balkan Peninsula). The bird is nesting and migratory and passing through Bulgaria. From the end of the 70s of the 19th century, the bird is known to nest in the Northeastern Bulgaria and once in a while in the dense forest of Kamtchia river. Since1975 this bird nests permanently in the Eastern and Western Balkan mountains and Strandzha. The total number in the country is 700-1,000 pairs at an average density of 1 pair of 50-100 ha; there are 400-500 pairs in the Central Balkan mountains. 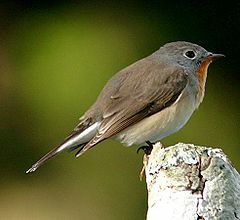 The red-breasted flycatcher inhabits mainly the old beech forests with natural structure and at 600-1,550m altitude. The matrimonial songs of red-breasted flycatcher usually are heard in mid-May to the beginning of July. The feeding of the small birds is throughout July, and between July 20 and August 10 the couples are often have a second brood. The nest is usually in a hollow, a hole or on a branch. The birdlings are 5 or 6 in number and usually leave the nest on the 13th day. The amount of the nesting territories in Central Balkan Mountains vary depending on the natural character of the forests of 7-8 to 25-30 ha. The bird feeds on insects, and captures its prey in a short circular flight. The flights of the flycatcher are from April to May and from the end of August to October. The bird habitats have already been protected in “Central Balkans” National Park, the protected area “The Black Hill” , “Bulgarka” Park and “Strandja”. The measure needed for the conservation of the species is the moratorium on the old forests in the protected areas.